A noteworthy feature of the Lord of the Rings, particularly as it was brought to the screen in the three recent films by director Peter Jackson, is its scenery. The tranquil Hobbit's shire and the misty surrealism of the elves' ancestral home at Rivendell are stunning achievements of New Zealand's natural beauty enhanced by the artistry of stage crews and CGI (computer generated imagery) technology. These are utopian landscapes, both in their idealized beauty and in their ideological ways of depicting visual milieus for the good life. Regarding the latter, the Hobbit's shire with its lowland kitchen gardens and Hundertwasseresque earthen-mound burrows is an environmentalist's paradise, and Rivendell with its Gaudi-like filigree, reflecting pools, lonely balconies and arcades, rising from an effervescent river in a hidden valley, is the idealized, sequestered academic cloister, where the immortal elves have safely archived the wisdom of the ages in runes. Utopias are sincere efforts to conceptualize ideal worlds built upon noble principles - and in current fiction and film these are dominated variously by feminist, environmentalist, multicultural, consumer, and technocratic paradises. The physical appearance of utopias naturally reflects the principles being promoted. 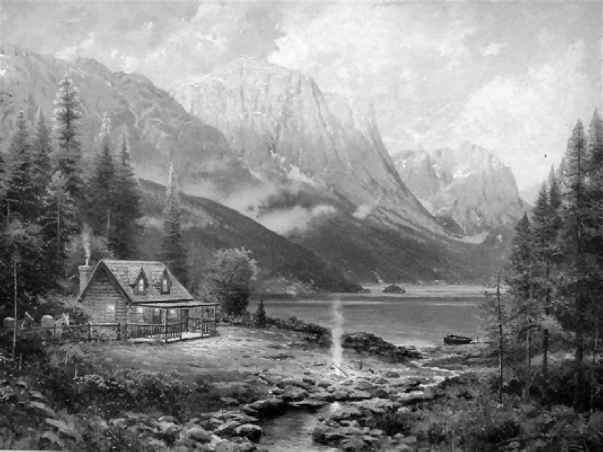 One particularly effective promoter of Yosemite and other wilderness tourist attractions was the painter Albert Bierstadt. Bierstadt visited Yosemite and other points west on three different tours with cartographers and geologists, beginning in 1858. He would make sketches and oil studies in the field, then return to his New York studio to recreate the scenery in huge oil panoramas that accentuated the pristine beauty and transcendent grandeur of the mountains, waterfalls and alpine lakes he had witnessed. 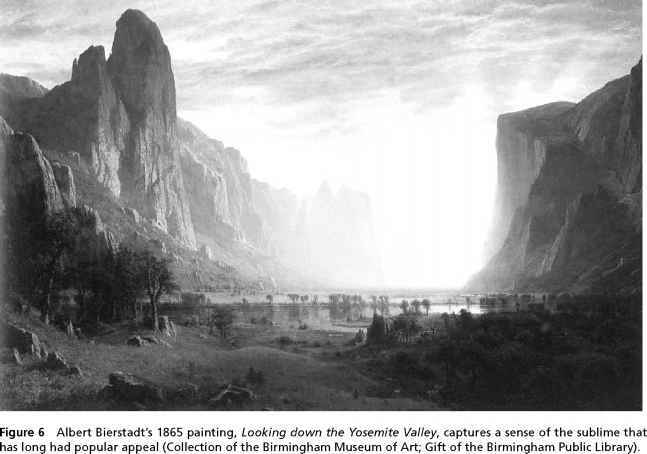 In one of the best examples of this, a massive canvas called Looking Down the Yosemite Valley (1865; see Figure 6), Bierstadt depicts the tranquil waters of the Merced River meandering through a trim green meadow, reflecting the oak trees that grow on its banks, with behemoth granite towers on the left and the sheer vertical face of Half Dome on the right. Luxuriant sunlight shines from the distant bend behind Half Dome, illuminating the forest primeval, beckoning an intrepid viewer to trek down the broad, flat valley floor toward God's radiant Shekinah. This is God's own holy temple, a place not made with hands. his paintings, the carpet in front of it is usually well-worn. His is an art of the people; his paintings captivate their imaginations and transport them to places they would rather be. His hyperreal depictions of sublime nature activate utopian feelings. Mountains in the Mist, Yosemite at Sunset, and The Shore of the Turquoise Sea are felt by many as the true dwelling places of their souls, places saturated with the numinous. Thomas Kinkade, the "painter of light," has inherited this mantle of painting translucent landscapes that minister to the soul. Still in his forties, Kinkade may be the most commercially successful painter alive today. It is not the sale of his original paintings that accounts for his success (he keeps these in his private collection), but reproductions of them in the form of framed prints sold at Thomas Kinkade Galleries located at malls across the country. More than ten million framed Kinkade's are now in circulation. They range in value from $200 for a poster quality print, to $500 for a canvas lithograph, to several thousand dollars for a print festooned with dollops and squiggles of paint applied by an assembly line of Kinkade-trained painters to give the canvas texture and the trademark luminescent effect, to more than $30,000 for canvas prints that Kinkade has personally touched up. For more modest budgets, Kinkade images are embossed on blankets, mugs, tote bags and cards that are sold through licensing agreements. In 2000, his operation posted $140 million in sales, clearing more than $90 million in profits. Figure 7 Painter Thomas Kinkade aims with his art to create a new "iconography" that eschews the despair common in contemporary art and seeks instead to reenchant the world. Beginning of a Perfect Day (©2005 Thomas Kinkade, The Thomas Kinkade Company, Morgan Hill, CA). Like Bierstadt, Kinkade receives no respect from the art world, but that only bolsters his conviction that he has ventured into genuinely populist territory. He is even brazen enough to describe his own achievement as creating a new "iconography" that is relieving despair and reenchanting the world for those who collect his work.16 That his images resonate with a public vastly outnumbering any that is reached by critically acclaimed artists, and that his admirers frequently describe the effect of his paintings in spiritual terms would seem to lend credence to the audacity of this appraisal. To appreciate what might be going on here, consider the work of Vitaly Komar and Aleksandr Melamid, two artists from the former Soviet Union who immigrated to the US in 1978.17 In 1993 they contracted a public opinion research firm to conduct a survey on what Americans like in a painting; 102 questions were asked about colors, styles, objects, even the size of paintings that people prefer. A cross-section of Americans was polled (1,001 adults). Komar and Melamid then studied the data. Their objective was to use market research as a mechanism to capture "the will of the masses," and then transform this into art. In their estimation, paintings produced in this fashion would be the essence of populist art - ask the people what they want and then give it to them. What could be simpler? After analyzing the data, Komar and Melamid painted two canvases, to which they gave the titles America's Least Wanted and America's Most Wanted. 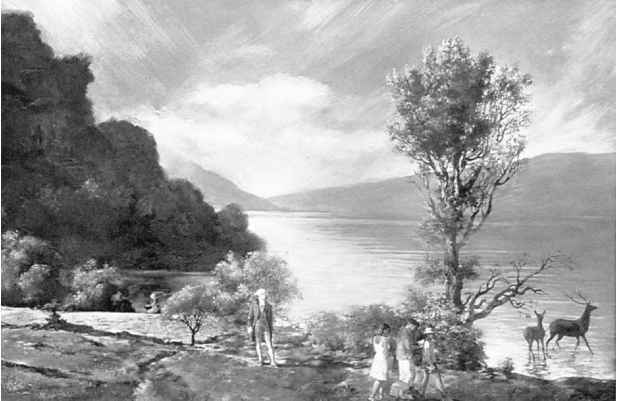 Following the numbers, their most wanted painting is an autumn outdoor scene featuring a lake, wild animals, three ordinary children and George Washington (historical figure), all wearing clothes and at their leisure (see Figure 8). It is the size of a dishwasher, predominantly blue with visible brush strokes, and realistic-looking. It bears a striking resemblance to Hudson River School in style and feel.18 Their Least Wanted Painting is abstract and angular (overlapping triangles), predominantly gold, orange and teal, and the size of a paperback book. Coinciding with the unveiling of these two paintings at a 1994 exhibition in New York City, Komar and Melamid commissioned variations of the survey to be conducted in ten additional countries, ranging from Iceland to China to Kenya, and then produced least and most wanted paintings for each of these countries. As a scientific sample, the combined data pool represents 32 percent of the world's population. Of the many surprising similarities that surfaced across the cultures represented, the most striking is that outdoor, natural settings are the clear favorite (66 percent), and blue stands out as every country's favorite color. • 60% like their paintings to be "realistic-looking"
Figure 8 This painting by Vitaly Komar and Aleksandr Melamid incorporates all of America's favorite elements of art as determined by a respected polling firm. Is this the art of the people? (America's Most Wanted Painting, 1994, used with permission of the artists). On the banks, on both sides of the river, there will grow all kinds of trees for food. Their leaves will not wither nor their fruit fail, but they will bear fresh fruit every month, because the water for them flows from the sanctuary. Their fruit will be for food, and their leaves for healing (Ezek. 47.12). It is not hard to imagine the millions of Kinkade framed prints hanging on living room walls in suburbs and high-rise apartments, or in win-dowless waiting rooms and offices across America, serving as elegantly framed windows offering a view onto this peaceable kingdom. While for some they may simply be escapist fantasies, for others these images reflect an inward groping for contentment that eludes them, and they stare searchingly down Kinkade's wooded paths. 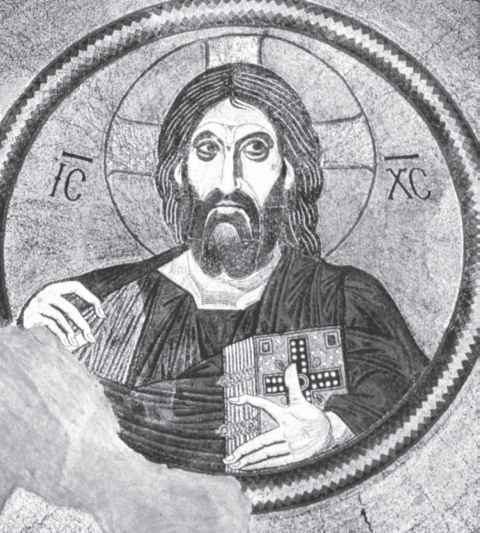 Like religious icons, these pictures can transfix wandering minds with the power of a reality beyond. "The power of profound meaning is found in blue," Wassily Kandinsky wrote in his book, Concerning the Spiritual in Art. Then he elaborated: "Blue is the typical heavenly colour. The ultimate feeling it creates is one of rest. "21 Kinkade's rustic iconography may aid the viewers of his prints in picturing a place where they hope their souls might finally find rest, and that picture lightens their anxieties in the present. 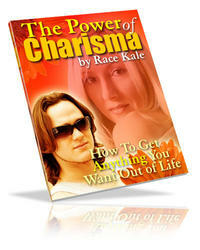 This is an eschat-ological dynamic - the way a positively envisioned ultimate outcome can lend greater meaning to events in the present and render life's many disappointments and insults more tolerable. From the vantage point of the end of the story - as pictured in an eschatological tableau - present potentialities can be sorted through, and those potentialities that will bring this ending to pass may be activated, while others can be left to wither.